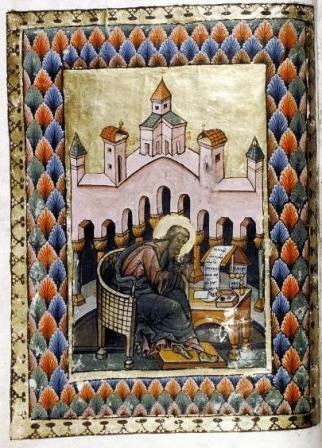 Author portrait of St Matthew, from Bodleian Library MS. Canon. Gr. 122. The first Medieval manuscripts masterclass of 2010, on Monday 18 October, was given by Dr Georgi Parpulov, Departmental Lecturer in Byzantine Art and Archaeology, University of Oxford. Dr Parpulov spoke about Bodleian Library MS. Canonici Gr. 122, a manuscript written and illuminated in 1429 AD. The talk was aimed at presenting a brief introduction to the manuscript and suggesting directions for future research. The following new translation of its scribal colophon (fol. 312r) was offered: “Through the benevolence of the Father, instruction of the Son and action of the Holy Spirit this Gospel Book was made in the days of the pious and Christ-loving Lord Voivod John Alexander, ruler of the entire Moldowallachian land, and of his pious Lady Marina. Burning with eager love [and] solicitous for Christ’s words, she readily gave [i.e. paid], and it [was] copied in the year 6937 and completed on the 13th day of the month of March by the hand of the monk Gabriel, Uric’s son, who copied [it] in the Monastery of Neamţ.” The eighteenth-century scribe who added Greek text in the volume’s side margins remains to be identified. The precise date of the book’s modern binding is also unclear. The text in MS. Canon. Gr. 122 belongs to the so-called “second (B) Athonite recension” of the Slavonic Gospel translation, abundantly attested in other manuscripts of the 14th to 16th centuries (including the “Gennadius Bible” of 1499 AD). The text alone appears to be of no great philological or textual-historical interest. The manuscript’s four miniatures, on the other hand, are of significant importance for the history of Byzantine art during the last decades before the Ottoman conquest of Constantinople (1453). They need to be made better known through the publication of good-quality colour photographs. During the discussion following the talk Dr Elena D-Vasilescu announced her discovery that the Venetian lawyer Giovanni Perissinotti (Pericinotti), to whom the present MS. Canonici Gr. 122 is known to have belonged in 1810, was a nephew of the renowned manuscripts collector Matteo Luigi Canonici S.J. (1727-1805).